What's The Best Car That Is The Ford RS200? There are many cars, but only some of them are the Ford RS200. 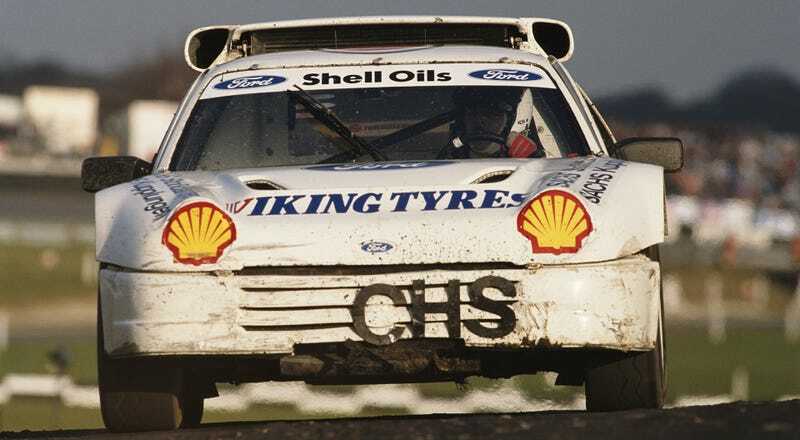 The Ford RS200 was Ford’s late entry to Group B rally. Styled by Ghia, designed by the legendary Tony Southgate, and constructed by Reliant, it was as strange a mishmosh as a car could be. It was also bonkers fast. Power came from a midengined Cosworth turbo four with anything from 250 horsepower in road trim to 800 in super boosted rallycross spec. That thing about rallycross is interesting. The RS200 debuted just before Group B rallying was cancelled, and it never was a huge success out on the stages. That makes sense — it never had time to really develop properly. However, after it was banned from rallying, the car got a second life in rallycross, where amateur teams really finished up the development and turned the car into the monster it always should have been. The great Martin Schanche (seen above) was its greatest, wildest pilot. Post your favorite car that is the RS200 below, and share your favorite stories as well. It was a great car, and it certainly was the greatest car that was the Ford RS200.